Over the last two years, the multitude of data leaks and breaches in the cloud has skyrocketed. Many of these leaks are reminiscent of the past security lessons, and some show new attributes unique to our evolving computing environments. In this short talk, we’ll take a look at the past, and peer towards the prospective future being discussed during year’s summit. Get a preview of how a major retailer solves the problem of security software chaos and fragmentation while addressing new security requirements. 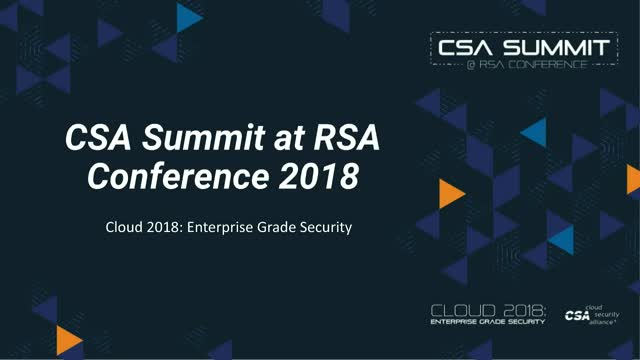 Get a real-world perspective on how they approached cloud security while addressing end-to-end compliance, data governance, and threat protection requirements. With the impending May 2018 deadline for GDPR compliance, organizations worldwide need to account for the regulation in their security policies and programs. Join us for a preview of our recent study with the Cloud Security Alliance on how organizations are preparing for compliance. Learn how organizations have taken CSA's Software-Defined Perimeter (SDP) from experimental to enterprise-grade. Join us for a preview of the valuable insights and hear best practices on how enterprises can make SDP adoption a reality that will be discussed at this year's summit.